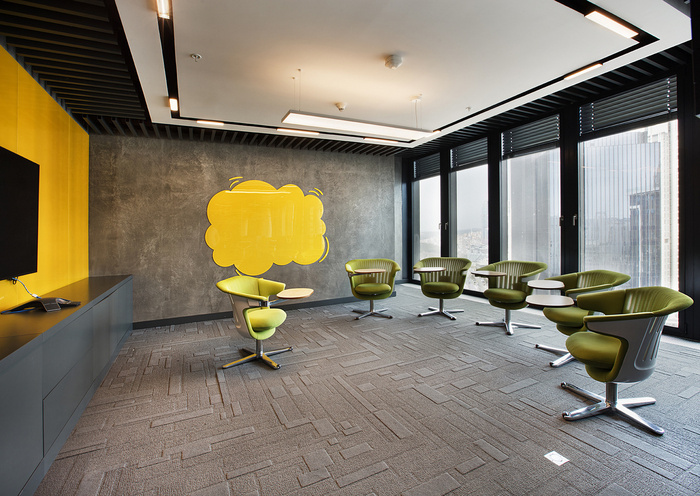 Bakırküre Architects designed the headquarters of British American Tobacco, located in Istanbul, Turkey. First of all, a workshop has been organised with BAT crew who have decided upon moving to ninth and tenth floor of Orjin Maslak located on the land of the most important business district of İstanbul. Regarding to the demands of personnel in the consideration of feedbacks of workshop, the design scheme has been created. A ‘Social Office’ has been designed focusing on social interaction and flexibility In stead of hierarchical and stable seating arrangement. Two floors with a total area of 4,500 m² have been connected by a functional and modern staircase located on the atrium created between floors considering to the closeness of entrance and reception. For young and dynamic BAT crew, motion-based working system has been designed. The circulation system has been attached considering to interaction between all the departments. This circulation system has been homogenously and accessibly activated by working units, social areas, meeting halls. The interaction between social areas and working areas has been based on sympiotical relation between them. Meanwhile, the key points of Project have been designed with different concepts including kitchenettes and, functional and colourful cafeteria. The Cafeteira has been planned as a comfortably spacious place in order to use daylong and include multi-funtional areas like meeting and recreation space. Unlike monotonous open office system; instead of uniform sestet working arrangement, diffirentiated working arrangement has been applied and also pop-up meeting units and coffee break places have been attached inside working hall. All the visusal elements on project including colour selection, graphic design and visual commicative messages emphasis the young and dynamic identy of BAT crew. Thanks to the variation of many illustations on different surfaces, lighting elements on floors and ceilings, the visual guidance on project has been provided for users. Modern, warm, timeless architectural decisions that respond to the needs of nowadays and the company and material choices that support these decisions have been culminated in whole. As a result of collabrating natural lighting, green texture, synthetic flooring, glass, marble and wood, it has been completed in three months and come into service .